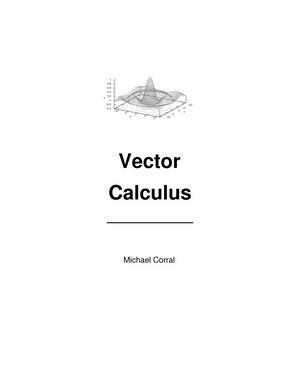 This is a text on elementary multivariable calculus, designed for students who have completed courses in single-variable calculus. Michael Corral wrote:This book is released under the GNU Free Documentation License (GFDL), which allows others to not only copy and distribute the book but also to modify it. For more details, see the included copy of the GFDL. So that there is no ambiguity on this matter, anyone can make as many copies of this book as desired and distribute it as desired, without needing my permission.